Not quite the result we hoped for last night after Monday however, all is not lost, a win at St Andrews followed by another win in a massive game against Man City will mean this Christmas and New Year period has been a very good one. Anyone who was there or saw the game last year at St Andrews will be desperate for some sort of pay back after that last minute leveler and there is a score to settle there. The game Against City is also huge for obvious reasons as City lie joint top in the league but after already beating them once and beating Chelsea on Monday, the belief will be there and the players KNOW we can win the big games. Both games could be crackers but both are ones we need to win! So lets win them!! Come on Arsenal! Also, i would like to wish everyone a Very Happy New Year. Perhaps 2011 can be the big one for the Arsenal. Have a good NYE whatever you do and stay safe. What a game that awaits us! No preview or prediction here, just a way for me to get the hype out of my system. Being in the middle of many deadlines along with Xmas and NYE promotional stuff in nightclubs, the trip to Old Trafford has been my motivation. Losing my voice in the last week hasn’t helped either but I am back and thankfully so is football. Someone told me the tension in X-Factor was just like football….er no! Football is what it’s really all about and Manchester United Vs Arsenal is the real deal. Since Mr Wenger has come to England, Manchester United Vs Arsenal has been the game to be at or watch. Yes, Chelsea have won titles after spending some money and now City are a threat after spending even more money but for me, Manchester United Vs Arsenal is what it is all about. As a football fan, I can only respect what Sir Alex Ferguson has done but to beat him and his team gives me such a great feeling and I believe we can win! Reasons why I think this? 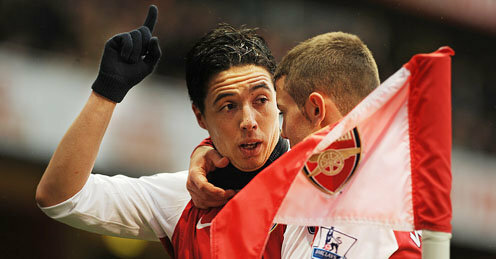 We have the most in form player in the league in Sammy Nasri. Nani has had a good season but id put Nasri just ahead. Sammy Nasri has been on another level in the last 6 weeks and I love it! I love him! Go on Sammy! Our away record is the best in the league; we have only lost once on our travels and have already recorded a great win in Manchester. We have a striker who in the big games can put himself about a bit (we had Arshavin up front last season at home against United!) In Chamakh and Van Persie, we have it all covered! 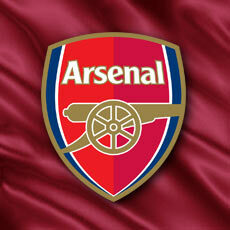 We are Arsenal football club! Yes, we may not have beaten the two other championship contenders for a season or two however, we know we can. The belief is there, we can beat Manchester United! Anyone making the trip up there tomorrow, ill see you on the M6, the away section will be rocking as usual and lets come home with three points. Three Points Is What We Want And Three Points Is What We Got! There are no easy games as people keep telling me and this season has proved that. Apart from the early season games against Blackpool and Bolton and the two early Champions league games, nearly every game has been quite tight. The away games this season have been great but have been tight too as games at Everton, Wolves, Blackburn and Villa proved. Home wins against Birmingham and West ham have also been close and we can certainly add Fulham to that list. The Fulham game was certainly interesting and there were a few talking points. Sammy Nasri kept his fine form going and is on top of the world right now. Even Rio Ferdinand on twitter is calling him Samir ‘the Angle’ Nasri and that’s because of his two amazing goals against Spurs and Fulham from tight angles. Nasri was outstanding once again and I am really enjoying watching him play and even more so really enjoying singing his chant! 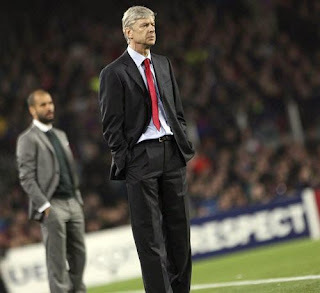 The Fulham goal angered Mr Wenger because there was a clash of heads and the game was allowed to continue and the Fulham front man scored. As we did go on and score the winner, I will not dwell into their goal to much but can see why Mr Wenger was upset. What was slightly annoying was a certain Mark Hughes, who we have a bit of a history with. I saw all game Mark Schwarzer taking his time with goal kicks and when Kamara was taken off, the score was 1-1 and he practically went off at a snail’s pace and Mark Hughes did nothing to rush him. After Arsenal went 2-1 up, Hughes was showing his watch to the referee and wanting Arsenal to hurry up; double standards or what? He wanted Fabianski to kick the ball out quickly but is happy for Kamara to take his time when coming off the pitch. What a joke! In fact, when Kamara came off, Hughes was clapping! Taking your time when your winning or holding on to a draw is apart of football, however, to do it yourself then complain when you think others are doing it in the same game is just wrong! Personally, I did not think Fabianski took very long to take his goal kick (I wanted him to take even longer!) but for Hughes to have a problem with this is just laughable. Off course, the legend that is, Thierry Henry was at the game and I must admit I started doing a Kamara after the game when walking out just in case I get a sight of our record scorer. I did see Mr and Mrs Wenger leaving the ground and Mr Wenger looked very pleased, he was asked about his January actions and I will not be surprised if he does bring someone to the club in the transfer window. It was nice to see Mr Wenger with a big smile on his face; it proves this week has been a good one. On my way to the Tollington, a flash dark coloured BMW X6 was stuck at the traffic lights and it was none other then Thomas Vermaelen (he was not driving in case you are wondering), a few young kids ran up to him and he was very welcoming and opened his window and signed their shirts. I shouted ‘we can’t wait to see you back Tommy’ and he replied with ‘I can’t wait either!’ and how nice it would be to see him back in the Red and White of Arsenal again. So we got the three points we wanted and went top of the league. 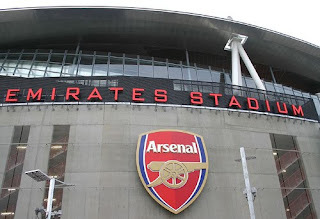 Oh I love football and oh I love Arsenal! Now focus turns to a huge game mid-week and a win will see us go through to the next phrase of the Champions League then we have a trip to Old Trafford. Football is a funny business, a great week is followed by a not so great week then you get a great week again then a not so great week….you get the picture, but we have put a few wins together and a good run in December could be vital with games against Partizan, Manchester United, Stoke, Chelsea, Wigan etc all to come followed by Birmingham away and Man City at home in early January. Roll on the week ahead! Come on you Arsenal! !